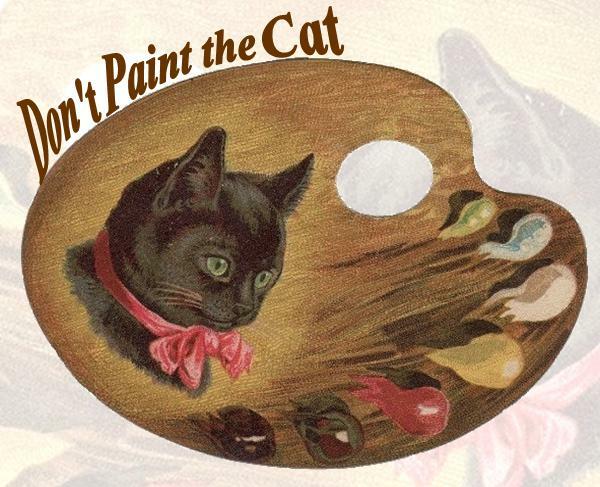 I follow one of our local cat rescues, Keller’s Kats, on FB. Last winter, they rescued so many cats and kittens who were nearly frozen. They did a fabulous job bringing each baby back to health. I thought it would be nice, and hopefully helpful, to have kitty warmers; a way of gently bringing the cats’ body temperatures back up to where they need to be. 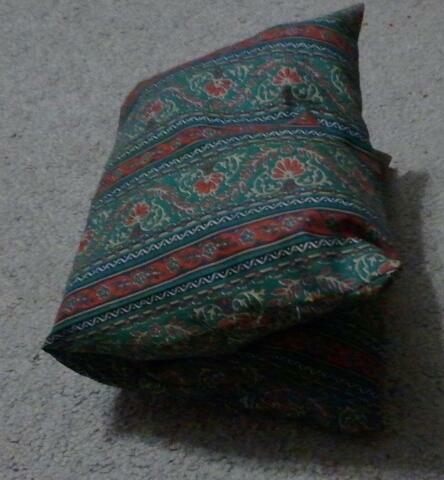 After some pondering over my favorite rice bags, I came up with a pillow bed that heated rice bags could go inside. I did two different versions. 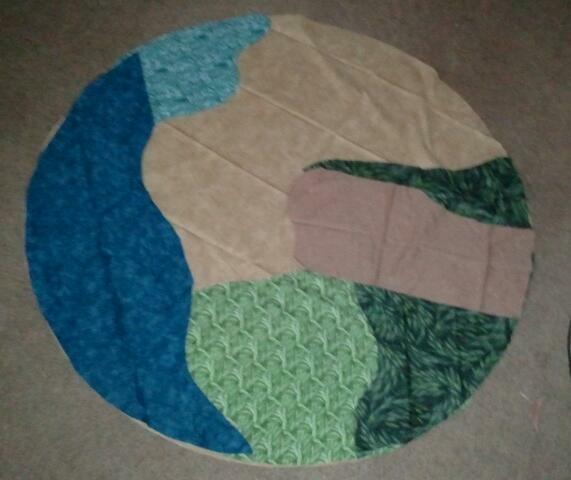 The darker green one with the raw edges hidden that took 2 machine seams and 3 hand seams. The lighter green is a quicker, mostly machine, method that has the raw edges tucked inside the pocket where the rice goes. 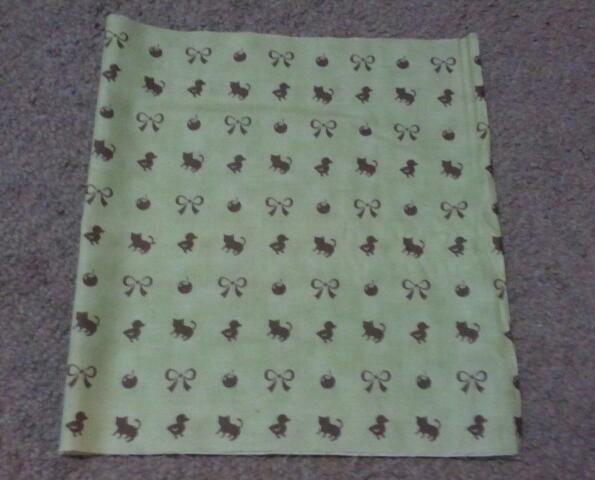 Each heatable pillow bed is made of a width of 100% cotton fabric cut 10″ to 14″ wide. I do want to make some slightly larger ones too. 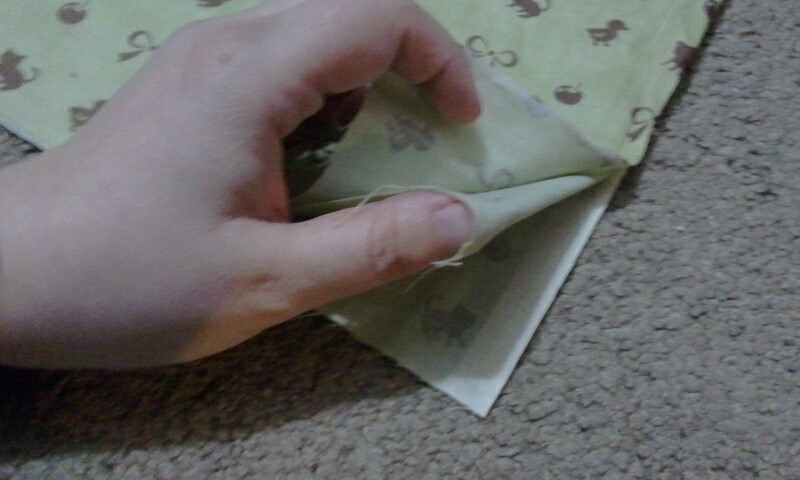 For the quicker method, with the right side down, fold the ends in lengthwise. Fold the folded ends back so the selvage ends are on the outside. I sewed along the raw edges with a straight stitch and zig-zagged the raw edges. This created two pockets on each side. Each pocket was filled with batting. I played with the fullness trying to get the right loft I thought would be good for a cat that didn’t feel well. 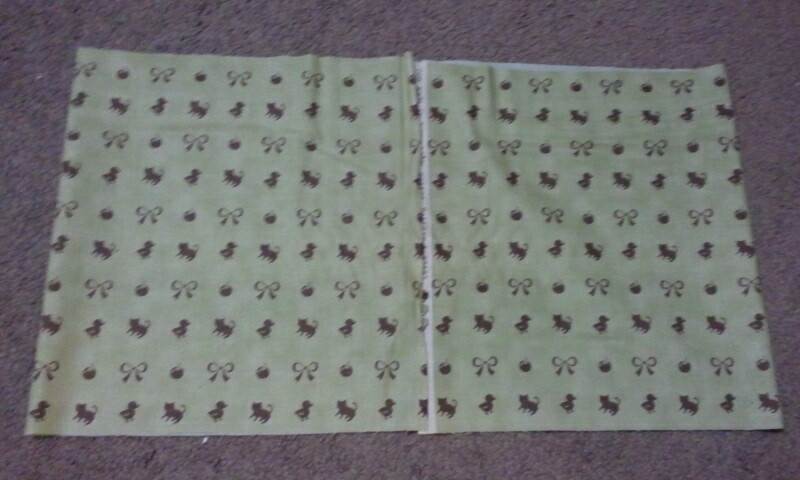 For the darker green ones, that I actually did first, I folded the long ends in right sides together. 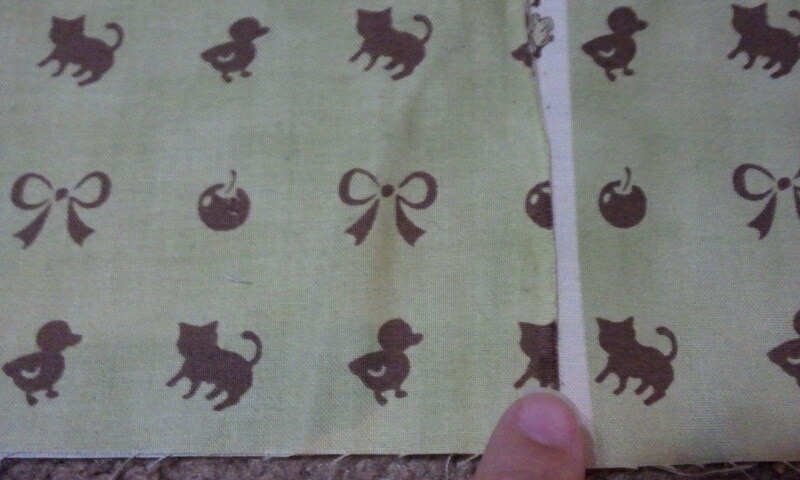 I machine stitched along the sides. Then turned them right side out for the pockets. Like above, I filled the pockets and whip stitched along the opening. 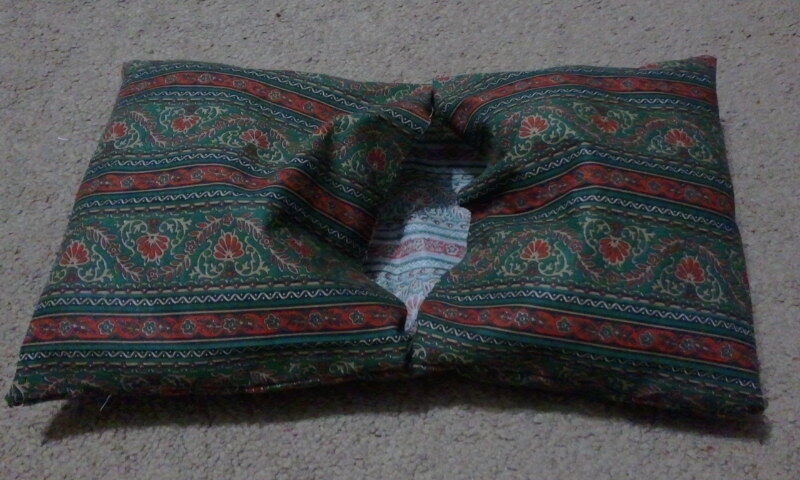 This pillow bed was then folded in half. 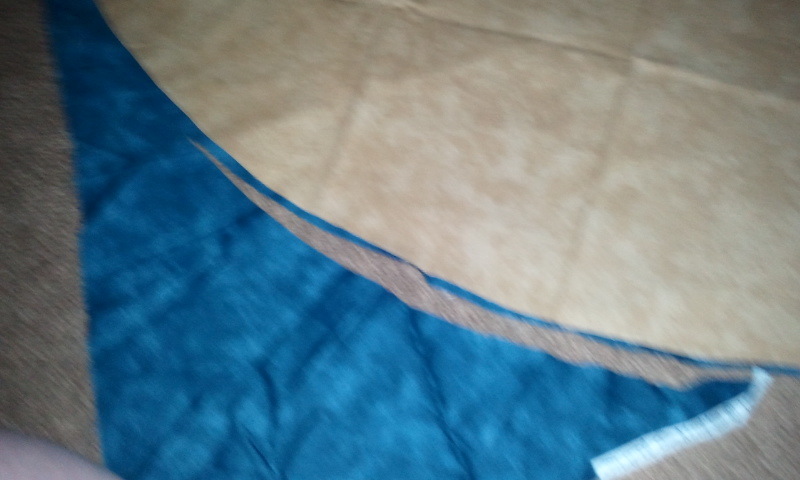 I whip stitched along the sewn sides to make the pillow. 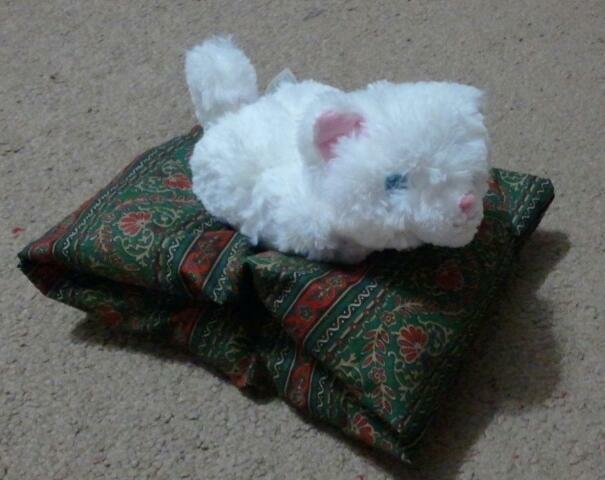 I did do a button-less button stitch in the middle to give the kitty a comfier place to sleep. I’ll see if this helps. Robo Kitty shows how a cat can sit on top. You can see the pocket where the rice bags slide inside. I suppose, you could fit a cat inside in case of an emergency as well. The pillow beds are washable. This was a must so they could be cleaned and used. I debated about the batting. At first, I was thinking wool, my go-to. Quilt batting wool would give the advantage of being able to be sewn into the pillow bed all at once. (poly quilt batting could too. But, I didn’t have any.) Then I realized wool could have two issues – fleas might like it and it could lump during multiple washings. The rice bags are not washable. These are simply rice in a muslin bag. Each one is 4″x4″ or 4″x5″. The fabric and thread must be 100% cotton. I filled them so they would lay flat inside the pillow bed. Each has shy of a half pound of rice. They are microwaved for a minute or two for use. I’ll share any feedback I get from the rescue about how they work or could be better. When I saw a Lego mat on Pinterest, my mind went wild with ideas for a mat for our nephew for Christmas. One with a landscape for dinosaurs or animals seemed like so much fun to play with and also fun to make.Oh, I should mention, the whole idea is to have a mat to play on that can then be drawn up into a bag with the draw string, toys inside. It just so happened that the idea came right before Chestnut Bay’s Scraptacular Sale. This was were all the fabrics in the bins were sold by weight. 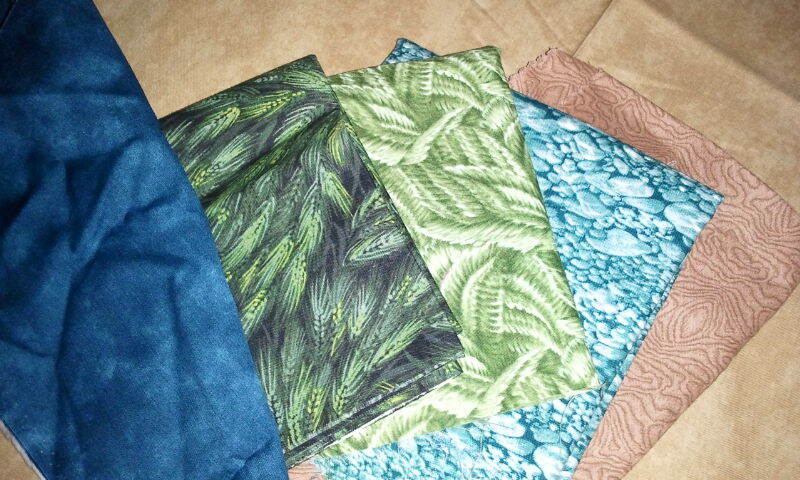 I was hoping to find an earthy brown print, a watery blue print and a grassy green print. How excited was I when I found two great water prints, two greens that were actual grass and two browns including one that looked like topography. This meant there could be deep, dark blue water and shallower, pebbly water…..Grass lands and a forest…. and mountains. 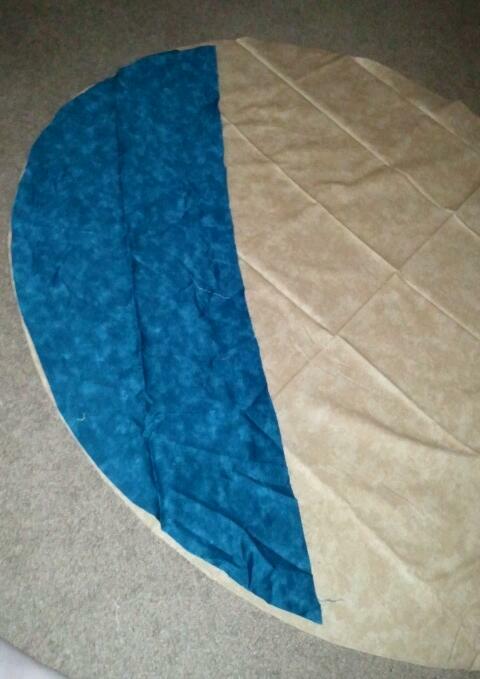 After cutting the outline, the water could be positioned on the top. I repeated this for each of the layers. Water… Water….. Grass lands…. Forest….. The mountains….. Trimming the non-circle edges to look more natural. I debated between making mountains or a cave. In the end, the cave won because it could also be a pocket… and, well, it was just cool.